IMG manufactures and supplies a range of Trailing Cable Accessories for use in industrial applications such as surface and underground mining operations. Typical trailing cables are not easily manuevarable at site and accessories such as cable clamps, cable reel stands, cable lifting arcs, and others are required to assist operators. 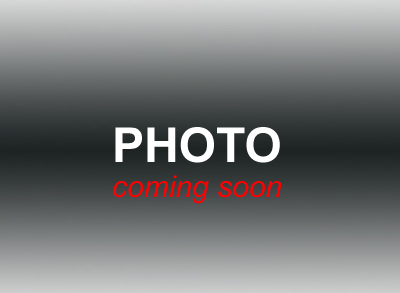 IMG custom-designs and manufactures various accessories products, as well as, supplies industry standards. For any additional requirements, please contact us with your request and requirements. Maneuverability of heavy trailing cables on site requires the use of various securing equipment. IMG supplies, manufactures and custom-designs such equipment to suit clients needs. IMG Cable Clamps comprise of two-part, durable, zinc-alloy cast and are secured with stainless steel/brass hardware. 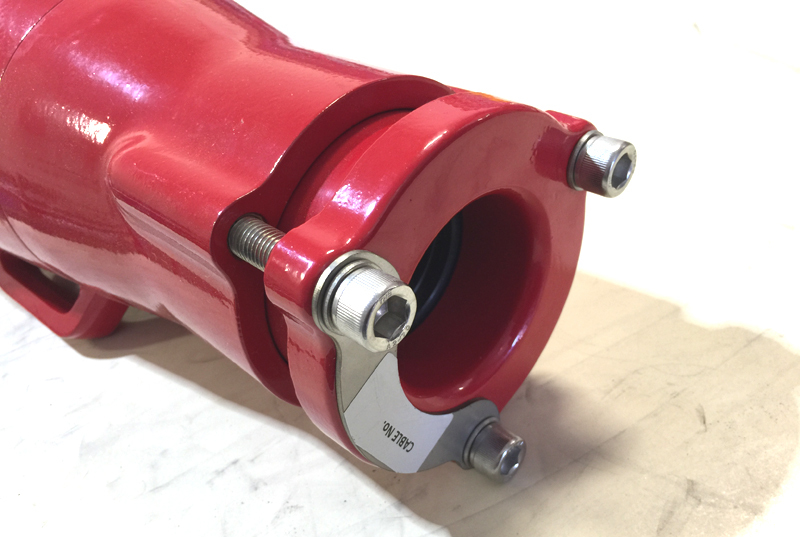 The eye-bolt system is easy to use and requires no special tool use in the field. 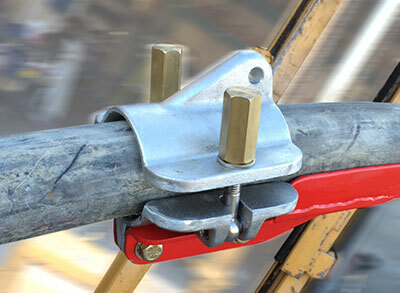 These types of clamps are used to secure the trailing cable to coupler skids and mobile equipmnent in order to prevent cable/equipment disconnection and/or damage to cable's ground-check system. The connection of trailing cables to equipment is typically accomplished via Equipment-Mount Couplers or direct install (hard-wire). Inorder to secure cable to equipment and reduce stress on the cable at the incoming point, Entrance Fitting (Strain Relief) is typically used.The IMG Cable Coupler Entrance Fitting (Strain Relief) has been adapted for this specific purpose. The advantage of this type of strain-relief is that it utilizes a special type of design that prevents cable slippage and provides moisture-free barrier between external elements and the interior of the electrical equipment to which the cable is connected to. Trailing cables are typically heavy and awkward to maneuver without the use of machines and/or equipment. IMG supplies, manufactures and custom-designs specialized, elevating equipment to assist clients in the field and in the shop facilities. The IMG Shovel Cable Lift is used to assist in elevation and relocation of trailing cables used to power large site machinery. For example, a shovel operator is able to use bucket to lift and relocate cable that is attached to the Shovel Cable Lift, and thus preventing cable damage typically resulting from cable being dragged behind equipment when equipment is relocating. The shape of the lift also prevents from the breakage of the Pilot Wire, thus tripping the pilot circuit and causing expensive shovel operation delays. IMG Cable Reel Stand are manufactured from heavy wall tubing and are painted with durable powder-coated method. 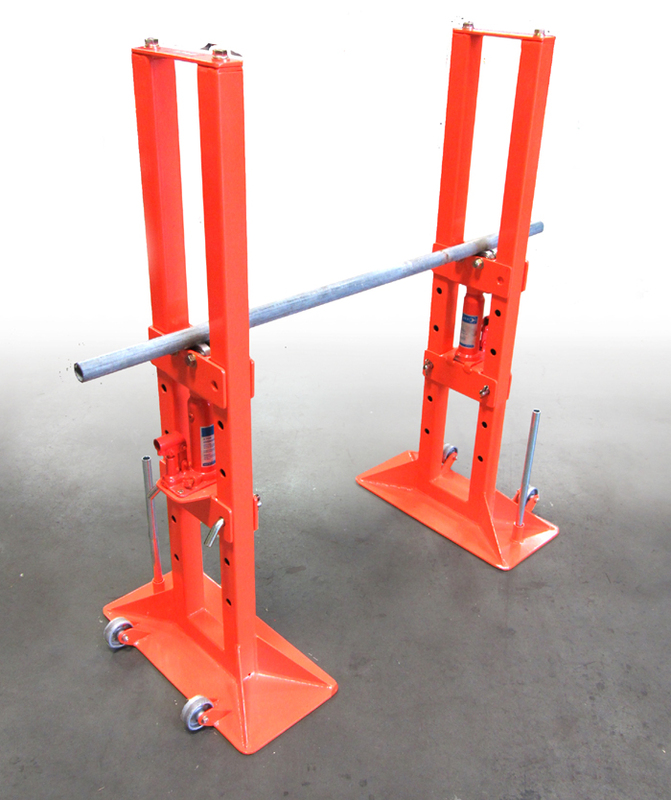 Standard safety orange color is used, but other colors available upon request. The stands incorporate 3 Ton hydraulic jack to allow for easy elevation of large, heavy cable reels measuring up to 80 inches in diameter. The stands also incorporate iron-cast wheels that assist in maneuverability of the individual stands. 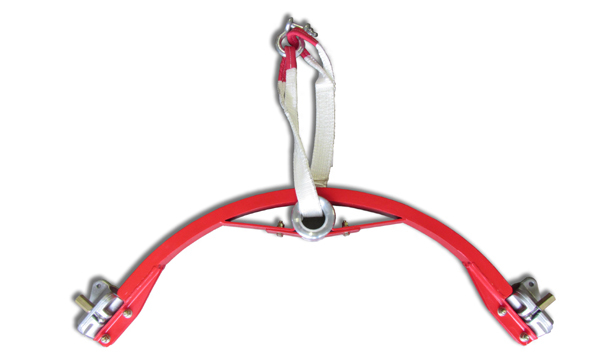 The IMG Cable Lifting Arc incorporate IMG Zin-Alloy, Eye-Bolt Cable Clamps, 10” double-walled sling and steel arc powder-coated for durable finish. 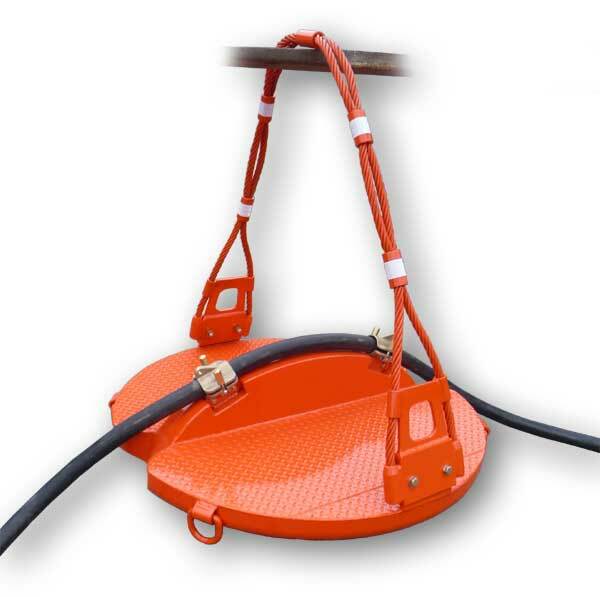 The Arc is used to assist in elevation of trailing cables over roadways and equipment, thus preventing cable damage resulting from ground equipment. The arc design eliminates cable stress, therefore also preventing damage of interior cable components (specifically Ground Check). Trailing cable typically carry high voltage and amperage, therefore, they can be dangerous to handle by personnel. Cables are also quite heavy and without a tool, require a field handler to bend and lift cables, exposing themselves to potential physical strain hazards. 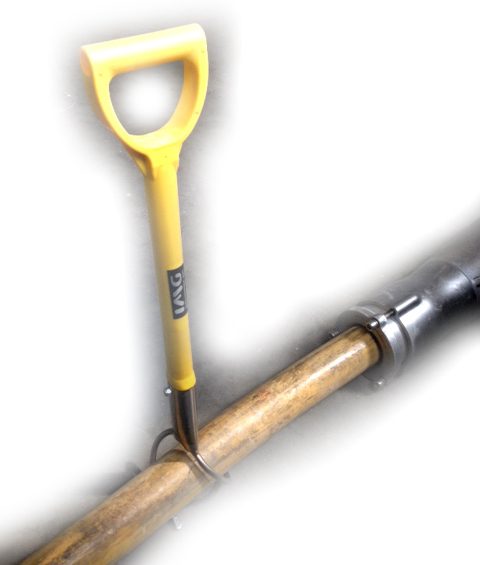 IMG supplies a Cable Handling Grip Stick that when used properly, reduces above health risk. Simply insert hooks onto cable, twist and lift. The harsh environment, where trailing cables are typically used, results in frequent damage to cables. The Cable Termination Guard is designed to protect a large, terminated trailing cable from damage and contamination during storage or movement around site. The guard comes in various sizes to accommodate different cable diameters. 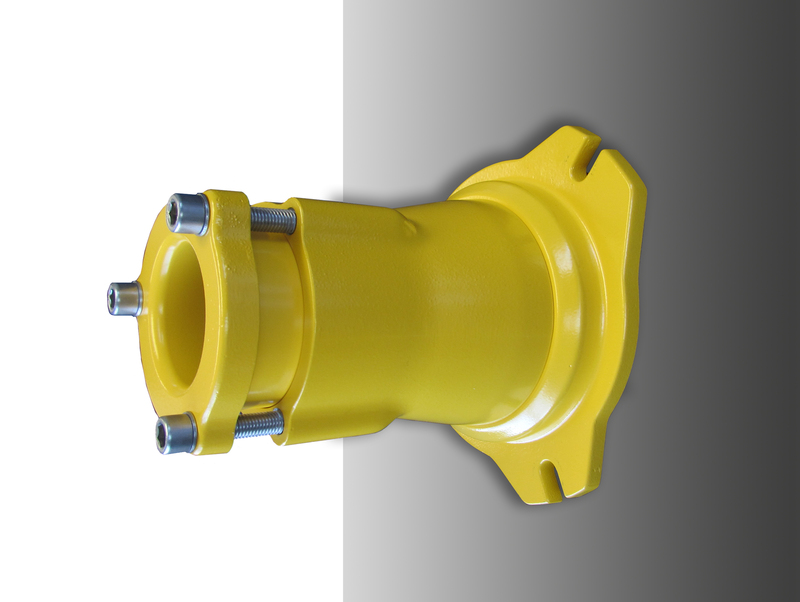 Eye-bolt system allows for fast and easy connection of protection bell. Rear Entrance Fitting is designed to be debris and moisture proof. Trailing cables are frequently damaged on site by moving machinery. In order to reduce downtime of electrical equipment powered via these trailing cables, IMG offers clients equipment and tools to assist in prompt, onsite cable repair. IMG Cable Repair Station is a skid-mounted for easy of transportation around site, equipped with a walk-in center fully equipped with HVAC (if requested) and all the necessary cable repair tools. The unit is equipped with two large, external cable reels on either side of the cable walk-in center. One side is an incoming section where damaged cable enters the shack and an outgoing section where the repaired cable exits, automatically wound onto a reel - ready for use. The IMG Cable Marker or Identification Tag is simple in its design, but can be a cost effective solution to identify required location of coupler/cable. Replace white tag (in photo) with stamped or engraved identification Cable Number or Location, as required. Therefore, when cable reels are being un-wound, the correct coupler/cable end will be quickly located avoiding costly cable rearranging.